What a fun week we had with two private group tours! Friday, a delightful group of homeschoolers came for an educational tour. 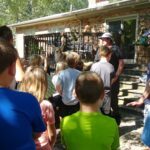 They learned all about animal husbandry and had loads of fun in the process! 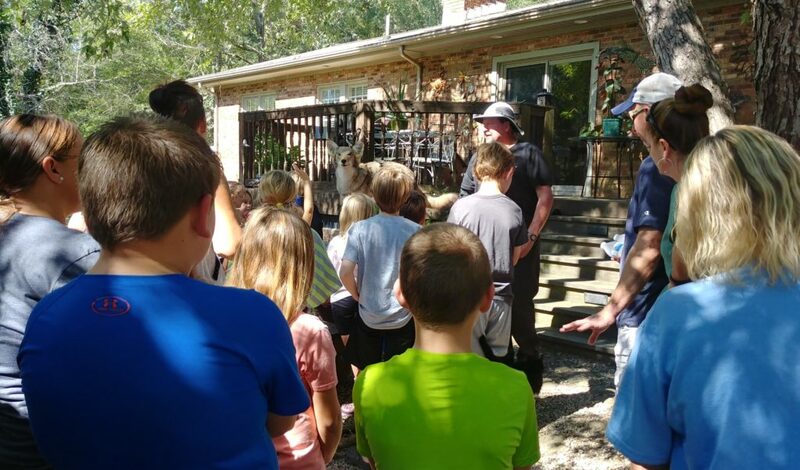 Here, Farmer Bob is teaching them about the predators we have in our area. 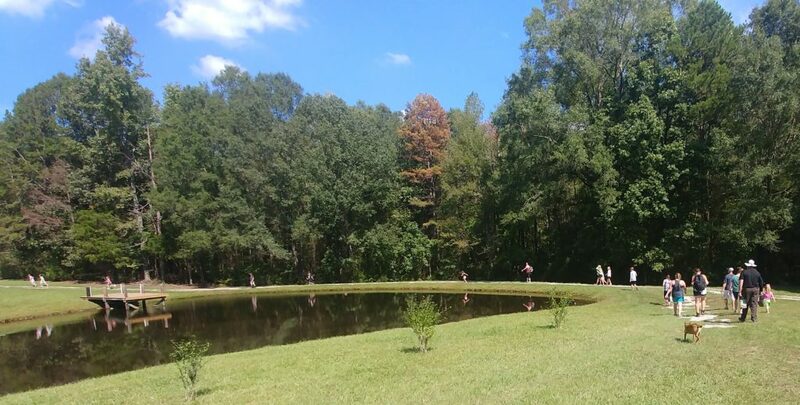 A visit to our farm counts as a “school day” for homeschoolers. We give the parents handouts to help them follow up with their children when they get home about all the things they learned about at the farm. They get to make the run across the pond dam. I’m thinking this may be a highlight of every group tour of school age children. I remember when I was their age, and a clear downhill stretch of lane was an invitation to run just for the joy of it! Farmer Bob’s arm is healing and he says that sometimes he feels like he has a 9 volt battery under his skin as the cut nerves mend. I’m so grateful for friends that help me do things that Bob would normally do. Here, our friend and farm sitter, Amy, helps me worm the sheep. We had another guy friend come and help with the heavy lifting of fence panels. Farmer Bob filled the drenchers and his friend passed them to Amy and me. Amy and I even got in the pen with the three big rams! I didn’t get any pictures of that because we were in a hurry to get the job finished and get away from them. 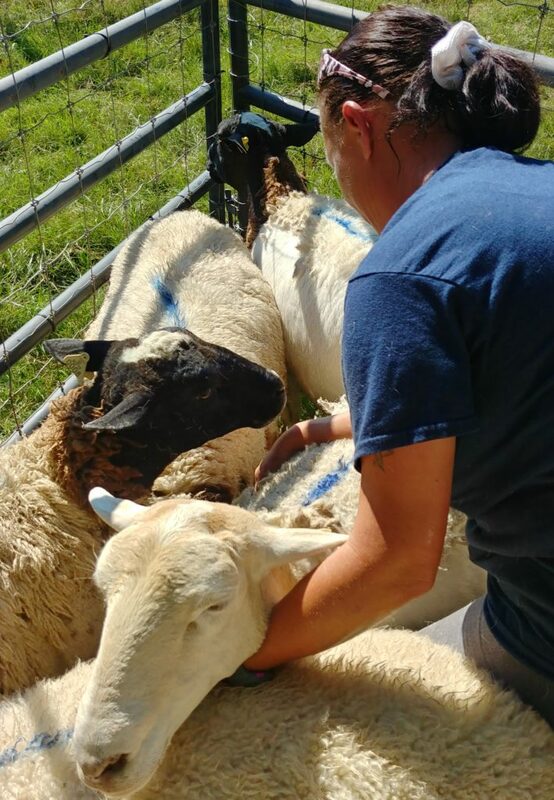 In case you’re wondering what the blue stripes are, we mark each sheep as soon as we finish worming them so we know who hasn’t been done. This past week I hosted a luncheon for our friend Mary, who has had to disperse her flock of Leicester Longwool sheep. (When you come to our farm you’ll meet Martha, who was one of Mary’s flock of these heritage sheep.) We girls are part of a wonderful group of friends who are always there to support each other when life hands us challenges. I love being part of such a happy, giving group of women. We came bearing gifts for Mary to cheer her up and let her know we have her back. 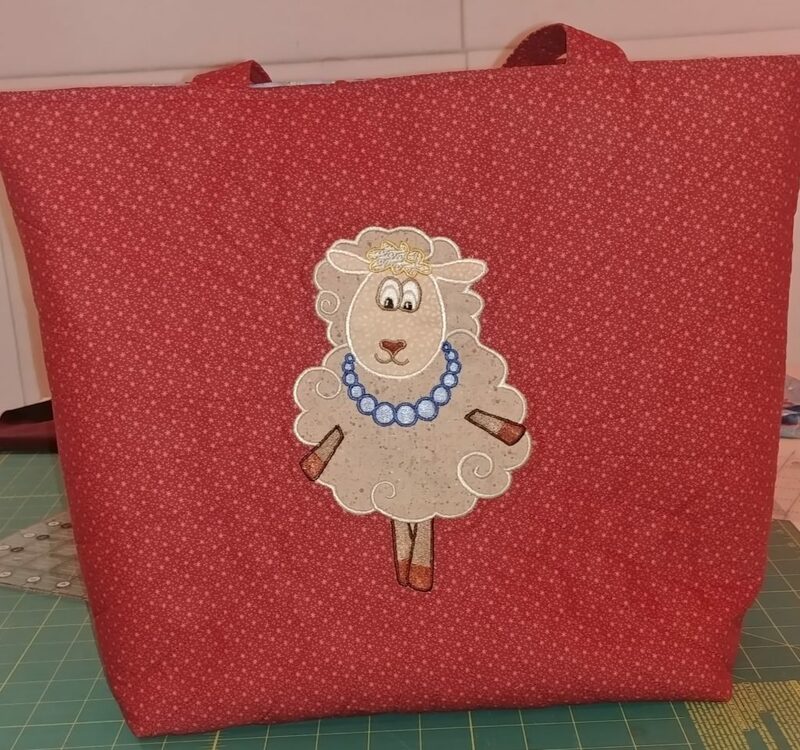 I’m learning how to use my embroidery machine, so I stepped outside my box of knowledge and figured out how to do machine applique in the hoop of my machine and made her a tote bag. I love these sheep, and so did Mary! I’ll be doing more of this because it was so much fun to make. 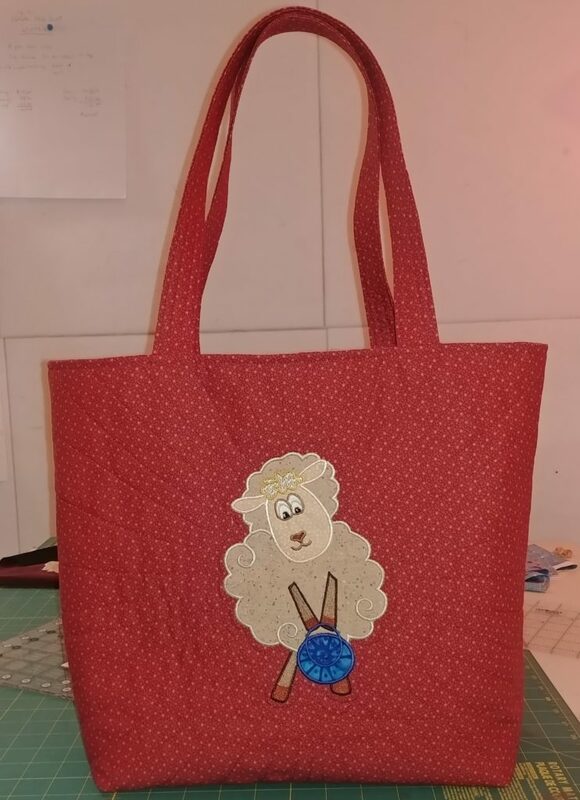 I put a different sheep on each side of the bag. -We have more new lambs! I think the count is 7 babies now, with 16 more ewes due any day. Our flock is growing quickly! -We’ll be back at the Waxhaw Farmer’s Market on October 27th with honey and soap to sell. -We’re gearing up to get some more meat processed and will have it for sale at the Waxhaw Farmer’s Market on Saturday, November 3rd, and at our farm market here on Fox Trot Farm on Sunday, November 4th. We can’t wait to put lamb chops, racks, legs, kabobs, and all our favorite dishes back on our own menu, and we hope you will enjoy our lamb, too! Call or text if you’d like to come by and pick up some of our farm goods during the week or to schedule a private group tour for 10 or more. 803-804-3541 is my cell number. We are open to the public most Sunday afternoons from 1:00-5:00, with a guided tour at 2:00. Hope to see you soon!